Alarm clock, television, torch, electric blankets, hairdryer, heater. Kitchenette with toaster, electric kettle, plates, cutlery,and bar fridge. Coffee, tea,hot chocolate and milk are provided. Table and chairs. A sofa to sit on and relax and a coffee table. 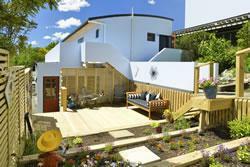 The unit has private external access to the rear terrace. We welcome children over 16 years of age. Alarm clock, television, torch, electric blankets, hairdryer, heater. Kitchenette with toaster, electric kettle, plates, cutlery,and bar fridge. Coffee, tea,hot chocolate and milk are provided. A sofa to sit on and relax and a coffee table. We welcome children over 16 years of age. Alarm clock, television, torch, electric blankets, hairdryer, heater. Kitchenette with toaster, electric kettle, plates, cutlery,and bar fridge. Coffee, tea,hot chocolate and milk are provided. Table & chairs. Two lounge chairs and a coffee table. We welcome children over 16 years of age. 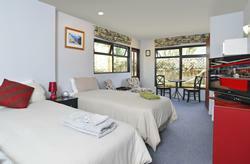 Ian and Janet welcome you to their recently refurbished comfortable Picton home. 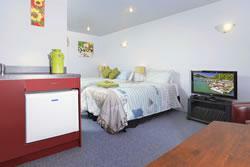 Anchor Down Bed and Breakfast was built in 2004 as a purpose built accommodation. Come here and use it as a base for your many activities in the Marlborough region or just sit back and relax for a few days rest and relaxation. Anchor Down is situated 5 minutes' walk from the centre of the Picton Township. There you will find local tourism operators, a selection of cafes, bars and restaurants. Anchor Down is also close to some lovely local area walks with stunning views. - Free pick up/drop off to the ferries, bus and train station. Ian and Janet will happily share their knowledge of the local area and assist you with finding activities. They have extensive knowledge of the South Island of New Zealand and are more than happy to point you towards areas you are interested in visiting during your stay. Anchor Down are proud to be members of the Bed and Breakfast Association New Zealand. Off street parking on site. A garage is available for motorbike storage if needed. Anchor Down is closely located in the gentle sloping hills behind Picton township. We are 5 minutes drive from the Ferry Terminal but maybe allow 6 minutes to accommodate the Picton rush hour traffic. If you are walking allow a leisurely 10 - 12 minutes, however we think it will take a little longer as you will be tempted to enjoy the waterfront views on your stroll to meet us. Don't forget we offer courtesy pick ups from the Ferries, Bus stop and Train Station. Downtown Picton is a 4-5 minute walk from our front door. All rooms are on the ground floor of the home. 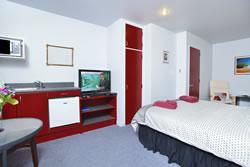 A 10% non-refundable deposit to be paid on the date the booking is made. This will be deducted from final booking payment on arrival. Full payment will be taken if your booking is cancelled within the 30 days prior to the date of arrival. We suggest all of our guests have travel insurance.